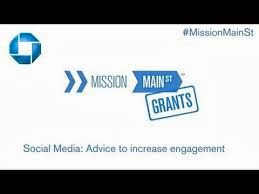 Mission Main Street Grants Program Awarding $250,000 Grants to Small Businesses -- Apply Now! Twelve small businesses will be awarded grants of $250,000 each from the Mission Main Street Grants Program. Businesses need to complete an application by October 31 and get 250 votes from Facebook Connect in order to get into the final round and win a $250,000 grant. Eligible small businesses cannot be start-ups but must be in business for two or more years. They also must have fewer than 100 employees to qualify as a small business. Non-profits are not eligible. Grant recipients can use the grant money to implement a business plan that will help them expand and grow. Eligible business expenses include a new location, equipment, and product or distribution channel. Businesses must be located in the U.S. Along with the application, business owners will be asked to answer 5 essay questions about their businesses. Mission Main Street Grants are sponsored by JPMorgan Chase Bank to help small businesses grow and remain an active and vibrant part of local communities. The company has a total of $3 million to award in 12 grants of $250,000 each to deserving small business owners.